We bring to the attention of our readers excerpts from this important study which further documents the war crimes committed by NATO against the people of Yugoslavia. During combustion, and detonation of explosives and energetic materials gunpowder (rocket fuel) uncontrolled releases large quantities of gas, products of combustion and detonation. Bearing in mind that the fry thrown over 30, 000 tons of various destructive missiles, bombs and rockets, the amount of gases released in a relatively small area is enormous and harmful. Bombing during the NATO aggression on Yugoslavia sparked fires in chemical plants, oil reservoirs and refineries. Combustion products are extremely toxic to the characteristics of poison gases such as phosgene or hydrogen chloride. In addition to this, freed oxides of nitrogen, cyano compounds, gaseous oxides of carbon and large amounts of soot, which are the direct causes of the greenhouse effect, Global warming. The use of incendiary ammunition containing depleted uranium 238 is the vision of keeping the radiological-nuclear war with all its consequences for wildlife FRY. The consequences are an increased number of serious illness that from year to year increase. Reducing the number of inhabitants according to the last census in Serbia in the period from 2002 to 2011 is -377,335, which is a city the size of Cacak. According to the Institute for Public Health of Serbia “Dr Milan Jovanovic – Batut”, “Cancer Registry in central Serbia 2011” in the period from 2002 to 2009, the total was affected only in central Serbia, 199 119 persons of both sexes, and died 99 . 846 persons. If we know that the cancer of different types of diseases elsewhere in Serbia, after heart disease and ahead of diabetes, Serbian nation, according to these statistics is very sick. We have a negative growth rate or more people dying than being born. However, the fact that an increasing number of young couples having trouble conceiving. There is reasonable doubt that it is also a consequence of environmental pollution that has arisen from the use of bombs of different chemical composition and lethal during the NATO aggression. That space is bombed FRY and other poisons (as Serbian military experts warned even during the war) confirms interview the Spanish pilots of fighter aircraft F-18, Captain Adolf Luis Martin de la Osa. It was immediately after the bombing, 1999, in the Spanish newspaper “Articulo 20” accused the governments of the countries which have committed aggression against the FRY for spreading false news about the war. He expressed the fact that killing civilians is not a mistake, but plan. “Several times our Colonel protested against NATO superiors because of the choice of civilian targets for bombing targets. They kicked him with insults and threats that the United States would file a complaint with the Spanish army, first in Brussels and later the Minister of Defence. But there’s more I want to announce this to everyone: one is data encrypted command of the US military to throw antipersonnel bombs in Pristina and Nis. Our colonel refused and after a few days came the order for his transfer. All this now declare is nothing compared to what I say when it was time, “said Captain Martin de la Os. “We are there does not mean anything. Not a word about the terrible accidents, losses, we’ve had outside of combat, contempt and sanctions, not even a single word! From anyone! As for the incorrect choice of targets and humiliation, we are perfectly aware that we are entering into a conflict against whom the majority of Spanish citizens, which is most important for us. What nobody says is that there is no comments, information or speech that the Spanish, the Dutch, the Portuguese, that we are all there, just to accomplish what the American generals decide. There are not any journalist who knows what’s going on in Yugoslavia. Are destroying land, bombarded with new weapons, toxic nerve gases, uranium bombs, napalm, sterilizing chemicals, herbicides that poison crops, all of this still do not know anything, “upozorovao Captain Martin de la Os. These are the words of a pilot who was under great pressure of his conscience and publicly protested against such a criminal act. After the bombing of our country, Alister Campbell second most powerful man in the UK press secretary of former British Prime Minister Tony Blair, told the “News”. 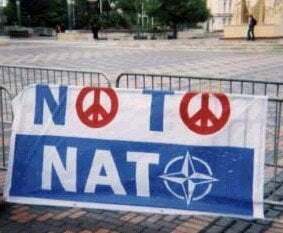 no regrets NATO bombed Yugoslavia. “Our task was to Milosevic withdraw from the policy of ethnic cleansing that Serbian troops to leave the territory of Kosovo, to create conditions for the return of refugees. We were right as we engage in it, “and further said that even knowledge of the trade in human organs in Kosovo did not stop in the belief of the correctness of bombardment. With advances in science and technology, develops and military technique with the use of new, modern materials and novel compounds with both destructive and poisonous properties, which is daily synthesized in the laboratory some of NATO. – Various kinds of so-called “soft” bombs that do not seem devastating, but true great damage. Apart from the use of depleted uranium in our country during the bombing have used a combination of explosives and rocket fuel with certain chemical compounds that reactions during the explosion released a very toxic and carcinogenic compounds or chemical radicals. Americans in the late fifties of the past century, they began to experiment with the introduction of fluoride in nitrojedinjenja type formal, in order to increase their energy value. In 1961, in the laboratories of Arlington, Virginia (Office of Naval Research), for the purposes of ” Aerojet-General Corporation ‘experimented with the introduction of fluoride in some nitro compounds for the Navy. Thus, in the course of these studies, which were aimed at obtaining new rocket fuel to propel missiles of increased range, synthesized fluorinated formals, very toxic compounds that are used as an addition to explosives and liquid propellants. In addition to the direct damage caused by the explosions of bombs and missiles on the territory of the FRY was conducted special warfare, which in its effects is one of the chemical war. The alliance did not directly use chemical agents (poison gas) in an attack on our country, but the bombing targeted target – industrial plants and warehouses of chemical raw materials, as well as burning oil tanks and oil installations, indirect effects caused by the consequences are very close effects of chemical warfare. Planned and are deliberately targeted plants and warehouses of chemical industry. Were bombed facilities in Pancevo, Novi Sad, Lucani, Prahovo, Bor, Baric. Due to the explosion and fire in air, soil and waterways due huge amounts of highly toxic and health hazardous substances: hydrochloric and sulfuric acid, nitric acid, chlorine, vinyl chloride monomer, etilendihlorid, mercury, PIRALEN, ammonia, and many others, also toxic agents . NATO aggression against our country and deliberately causing an environmental catastrophe, endangered area with sources of unpolluted water (Serbia is the area with the highest number of healing mineral springs in Europe) and health food, which is directly affected area around the Balkans and Europe. All explosive compounds in a molecule containing certain molecular groups that are bearers of explosion characteristics. Usually, these are NO2 groups in the molecule and which further comprises carbon, hydrogen and oxygen, so that any of the explosive can be represented by the general formula CxHyNzOp. The functioning of explosives is extremely fast oksidacija- detonation, whereby, in a very short time, in the order of nano seconds, releases huge amounts of energy, followed by a large amount of hot gaseous products of detonation under high pressure by a devastating effect. The resulting gaseous products contain a variety of gases such as carbon dioxide, carbon monoxide, nitrogen oxides, a cyano compound, hydrogen, nitrogen, water in the form of water vapor and elemental carbon in the form of soot. The released gases themselves are highly toxic, and when combined with the products of the combustion of certain chemical compounds, then it can have effects of chemical warfare. Conventional explosives (general formula Cx Hy Ou Nz) during the chemical decomposition, explosion, released earlier mentioned different gaseous products of detonation. Table 1 shows the compositions of explosives that were in the powder inside projektila- destructive bombs and missiles which targeted the territory of the FRY. High explosives, trotyl, hexogen and octogen, added and other energy-rich substances, such as ammonium perchlorate, ammonium nitrate and aluminum powder that is used in incendiary munitions, CCR is shown in Table 1. Decomposition of explosives containing ammonium perchlorate, produces highly toxic chlorine compounds, oxides or chemical radicals and, in particular, adiabatic conditions governing the knock comes to the appearance of elemental chlorine, which is extremely poisonous, suffocating and aggressive. Chlorine oxides and radicals freed detonation with water from the air creates acid rain due to which it comes to the destruction of vegetation.